We love a good photo printer, but keeping it fed with with genuine inks and premium paper can can hurt your pocket, and it can also be a pain trying to nail the right settings to get the best possible print quality. With plenty of online printing companies offering to print your shots at 6x4-inch size for as little as a few pence each (plus a little extra to post them to you), it can be a cost-effective and hassle-free way to get printing. Some online companies that also have high street shops may even let you have your prints delivered to a local store for free. But as you'll see, not all photo prints are created equal, and there can be a marked difference in print quality between printing companies. To separate the eye candy from the eye sores, we uploaded a selection of colour and black and white images of various subjects, including some portraits to assess skin tone reproduction. We also threw in our standard printing test chart for a more scientific measure of each company's printing quality. In case you're wondering, all our prints were ordered and paid for as regular customer orders. That way we could guarantee the prints that came back would be a fair representation of the quality and service you'd receive, with no chance of any special press treatment. Size it up: 7x5-inch enlargement prints can suit 3:2 and 4:3 images with minimal cropping, and they often cost little more than 6x4 prints. For this comparison we opted to order 7x5 prints. Extra ratios: Some printers also offer 7.5x5, 6.5x5, and 5x5-inch variations of the standard 7x5 size, so you can tailor your prints to perfectly match your images’ aspect ratios. Photo finish: almost all online printers will give you a gloss or matte print surface choice, and some also offer a luxury heavyweight paper option. Delivery: Forget waiting for weeks to get your prints - we found most printers to be super-speedy with their UK delivery, and that was without paying for premium P&P. Uploading: Clear and easy-to-use print preview software will minimise the chance of you receiving prints that aren’t as expected - ensure you're aware of whether an image is likely to get cropped, and by how much. Thankfully print quality doesn’t let the side down. Colours are accurate, highlight and shadow areas well resolved, and there’s plenty of fine detail. Those comprehensive aspect ratio options ensure no nasty cropping surprises, and only the Jessops Photo images could match the neutrality of our black and white image samples. Our only minor gripe is contrast could be slightly boosted, as some of our prints look a little flat under close scrutiny. 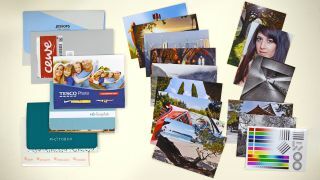 Being a high-street retailer, Jessops Photo offers a click-and-collect print service where you can pick up your prints in just two hours, at a tempting cost of 30p per 7x5 print. We went for the standard online service costing 18p/print, but opted to have them delivered to a local store for free, making Jessops Photo the most cost-effective printer for small-volume orders. The online uploader and image editor strikes a good balance of functionality and ease of use. It’s not quite as effortless as Bonusprint’s uploader, however, and you don’t get any aspect ratio variations of typical print sizes. But it’s hard to fault print quality. Colour vibrancy is the best on test, with one of our sample images - of a scarlet Ferrari - leaping from the paper and making all rival prints of the same shot look dull by comparison. This wow factor is helped by contrast that manages to be punchy while still retaining good shadow detail. Black and white images also look the part, with no colour cast. Cewe offers comprehensive downloadable print preparation software, but the online previewer is short on functionality. Only the software allows full control over how images are cropped to fit the six available print sizes. There are no non-standard aspect ratio options and square prints are only available in a set of at least 16. Price-wise, it’s 20p per 7x5 print, but this quickly drops to 17p/ea if you order 20 or more, and 12p per print when buying 200+. Postage is a fair £2.95, and Cewe’s prints reached us in two working days. We enabled Cewe’s Photo Optimisation option - a free feature claimed to tweak image sharpness, colour, and contrast for better prints. Sadly it wasn’t quite enough to give our samples a winning edge. Though we didn’t spot any major issues, many prints had overly lightened shadow areas, leading to slightly flat overall contrast. Black and white shots also exhibited a small but noticeable magenta cast, and this was also visible in neutral areas of colour images. Some web-based image upload and preview pages can seem a bit dated and are clunky to use, but Snapfish’s software is, well, snappy. It’s also clear and intuitive, but while you can get square 5x5 prints, there are no other aspect ratio variations of the 7x5 print size, so expect 3:2 images to arrive cropped. Print quality is mostly attractive, with good colour, contrast, and detail. The only issue we found was a subtle but nevertheless noticeable magenta colour cast affecting black and white prints, as well as neutral areas of colour images. That’s a pity given the relatively expensive cost per print. We were also less than impressed with the four-working-day delivery time - the slowest by some margin - although at least the P&P cost is reasonable at £2.99. It’s worth noting that Snapfish also provides Boots Photo with its online print services. Plus, like many online printers, Snapfish regularly runs discount codes that can substantially cut the cost of your order. At a relatively pricey 25p per 7x5 print (and that doesn’t even drop if you bulk order), we were expecting a lot from Photobox’s image quality. Unfortunately we found it average at best. Our test chart print sample revealed slight pixelation of fine lines - an issue not visible in the same print from the other printers - yet all our other sample photos were slightly soft, blurring fine detail. We also spotted minor banding in areas of subtle gradations, and flat contrast made some images look relatively uninspiring and washed out - especially mono prints. The only consolation is none of these issues are glaringly obvious. Photobox does at least offer a 7.5x5-inch print option, in addition to the usual 7x5. The difference may seem subtle, but a 7x5 print of an image captured by an APS-C or full-frame camera will be noticeably cropped on either side. Standard delivery is £2.99 and we had our prints in just two working days, but if you need even faster service, expedited delivery is also available. Tesco advertises 7x5 prints at 11p each, but that’s only if you order over 500. 1-199 prints will be 30p a pop, making these the priciest pics here. At least delivery is free to a Tesco Extra store, or a minimal £2.25 if you’d rather have them posted. We opted for the latter, and were impressed to receive our images in only two working days. The online order process is clear and simple, with large image thumbnails and obvious cropping preview outlines. Unfortunately only traditional print sizes are available - 6x4, 7x5, 8x6, 10x8, and 12x8 - so a 7x5 print will result in slight cropping of a 4:3 or 3:2 image, and there are no options for square prints. But the biggest issue with Tesco Photo is print quality. Though our test prints benefited from reasonable colour accuracy and good detail in highlights and midtones, every print was ruined by severely darkened shadows. This totally obscured any detail in these areas and made every print look obviously dark and unappealing.